The Original Spirograph design set features the iconic wheels and rings of the original and has been re-engineered and updated for today for you to create better designs than ever. The precision engineered Spirograph gears work with the 2 design pens and 6 art markers as well as with most standard pens, markers and pencils. 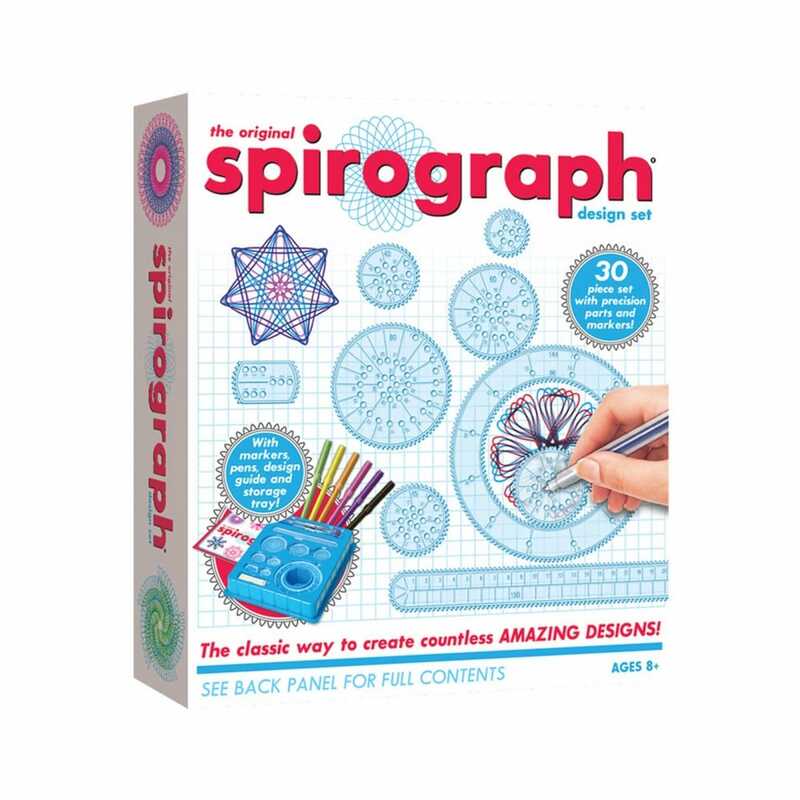 The new Spiro-Putty holds the Spirograph pieces securely on the paper so that you can create intricately beautiful designs. The set also comes with a snap-in storage tray, 10 pages of design paper and a full-colour design guide. The guide book explains the fundamentals of drawing with Spirograph as well as step-by-step instructions for creating your own designs! Contents: 7 Spirograph precision wheels, 1 Spirograph precision ring, 1 Spirograph precision rack, 5g of reusable Spiro-Putty, 2 design pens, 6 art markers, 10 page guide book, 10 sheets of design paper and 1 snap-in storage tray. Showing 3 of our total 4 reviews, with an average rating of 5 stars. Read all 4 reviews for Flair The Original Spirograph Design Set~. Great price, good product and the grandkids love it. Excellent service, quick acknowledgement of order & very quick despatch. Item came boxed on cardboard, string but minimal packaging. All pieces were brand new. Grandson immediately started using & creating designs. Perfect retro item for both young and old. Grandkids love it & haven't stopped using it since it arrived. Great value and good for occupying children.